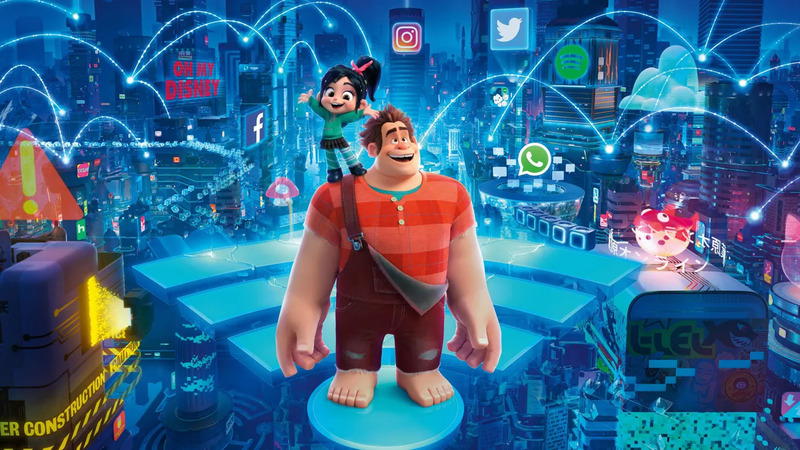 Ralph Breaks the Internet – For a long time, Disney kept sequels to their animated films direct to video after The Rescuers Down Under had an underwhelming box office take. I suppose you could count The Three Caballeros, Fantasia 2000, and Winnie the Pooh as theatrical sequels, but those were all follow-ups to package films, so they didn’t really have to continue the story. But now, not only is this Wreck-It Ralph sequel in theaters, but there’s a Frozen sequel slated for release next. Both of those were pretty complete stories in themselves, so it kind of seems like just cashing in. As far as I know, the only thing people really wanted to see Ralph do was interact with other popular video game characters who weren’t in the first movie, and that doesn’t merit another full-length film. In fact, not only was Mario not in this one as had originally been intended, but I don’t think any Nintendo characters were, nor were any new ones who weren’t in the first movie (well, as far as I could tell; I might have missed a brief cameo or two). Instead, it focuses on Ralph and Vanellope’s friendship, with him being content to do the same things together every day, while she wants something new. When a kid accidentally breaks the steering wheel on the Sugar Rush game, the two friends go online through the arcade’s new wi-fi connection to buy a new one on eBay. Vanellope finds an online racing game where she wants to stay, and Ralph is so scared of losing her that he unleashes a virus into the game that eventually spreads all over the Internet. It’s a lot like the Cybug from the first movie, really. The moral is that you can stay friends even if you have different goals, but that largely takes a backseat to a rapid-fire series of Internet jokes. Enough of them landed to make it a generally positive experience, but many were pretty trite at this point. There were some amusing new characters, like Alan Tudyk’s KnowsMore, the persistent and cheerful eBoy, and the sleazy but still somewhat charming J.P. Spamley. I do have to wonder what the message is when a personification of pop-up ads is portrayed sympathetically. Despite some fairly modern references, there was kind of an old-fashioned feel to its take on the World Wide Web, from back when it was still impressive instead of typical. Of course, the Internet IS still amazing in many ways, but it kind of seemed like it came a decade or two too late to make much impact in that respect. Maybe that’s appropriate as it’s a sequel to a movie largely about 1980s video games, but I think it didn’t work anywhere near as well. Maybe an ongoing subplot back at the arcade would have helped. What I did think worked pretty well was the crossover aspect, with Disney taking advantage of being a huge entertainment media conglomerate. Since I don’t think they’re planning on crossing over most of these properties, this might be the only time we’re going to see Pixar, Star Wars, Marvel, and Winnie-the-Pooh characters along with Disney Princesses. Many of them had their original voice actors, or at least ones who’d done their voices recently, with an exception being screenwriter Pamela Ribon as Snow White. 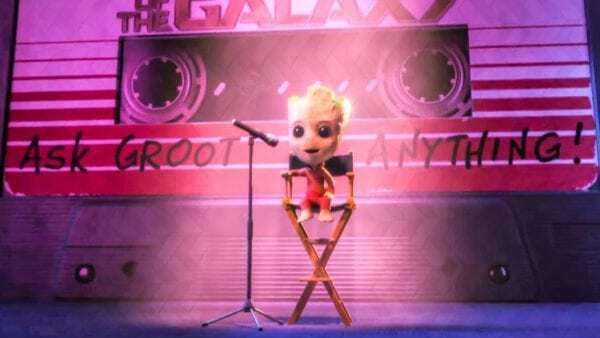 The Princess and Groot scenes had already been teased, and they were some of the best scenes in it. I’d actually wondered before hearing about this whether Vanellope would count as a Disney Princess. I mean, she’s potentially more qualified than Merida, who’s a princess but technically from a different studio; or Mulan, who’s a female protagonist but by no means a princess. There were a few interesting connections made that I hadn’t noticed before, like how many of the princesses sang while looking at some kind of water. And I suppose Groot COULD be related to Yggdrasil, although the World Tree’s nature in the Marvel Cinematic Universe isn’t entirely clear. The movie also had a reference to Tron, a Disney movie from the 80s ABOUT video games. I’m kind of surprised they didn’t mention Kingdom Hearts, a franchise I don’t know a lot about but that I’m certainly aware includes both Disney and Final Fantasy characters. Come to think of it, there was a Star Wars machine at Litwak’s Arcade in the first movie, although I think it was gone by the time Sugar Rush showed up. So, I found it disappointing considering how much I liked the original film, but I still found it to be worth watching. Beth didn’t like it at all, though, so that’s obviously not true for everybody. This entry was posted in Advertising, Cartoons, Comics, Humor, Mario, Mythology, Norse, Relationships, Revisiting Disney, Star Wars, Technology, Video Games, VoVat Goes to the Movies, Winnie-the-Pooh and tagged alan tudyk, disney princesses, ebay, groot, guardians of the galaxy, Marvel Cinematic Universe, marvel comics, mulan, pamela ribon, pixar, princess merida, ralph breaks the internet, sequels, snow white, sugar rush, tron, vanellope von schweetz, wreck-it ralph. Bookmark the permalink.